It might sound a little counterintuitive to decorate for your Great Gatsby party before you even begin the book, but let me explain the merits of this flipped thinking. 1. You will set the stage to engage- I just finished reading The Wild Card by Hope and Wade King, and they report that teachers at the renowned Ron Clark Academy are masters at "shocking and surprising" students for ultimate engagement. Hope King is the queen of classroom transformations and while I can't pretend that I've come anywhere near her level in my high school classroom, I can attest that just a few items of decoration can completely transform a lesson. For example, instead of doing traditional "book talks" for our free-choice reading, on a whim, I set up my classroom to look like a speed (book) dating event. I literally took me all of 10 minutes to set up by using plastic tablecloths and string lighting, but the results were incredible. 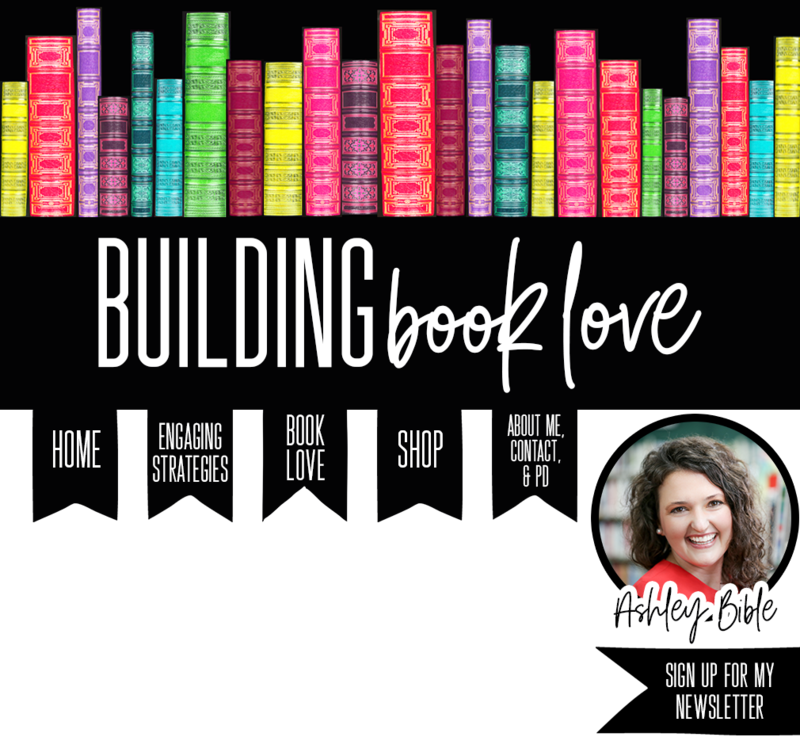 There was so much laughter, engagement, and book love going on that day! I vowed to create more experiences like this each chance I got, and I was so happy that master teachers like the Kings validated my goal. 2. 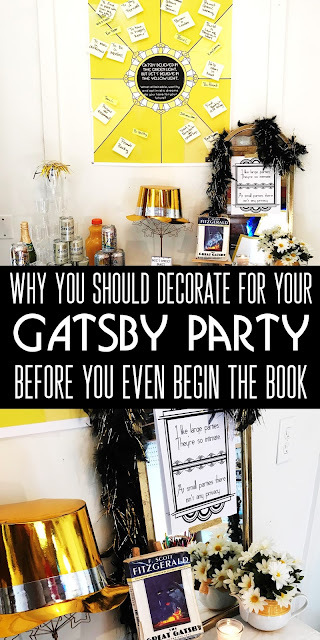 You will get more bang for your buck- If you are going to buy some decorations anyway, why not use them to engage students throughout the entire unit rather than just one day for your Gatsby party? The Dollar Store is such an anomaly. How can a store with nothing costing more than $1 take so much of my money!? 😵Ha! Even when you try to buy things cheaply, they can still add up, so make sure you get the most bang for your buck by using some of your decorations throughout the unit! (you can also reuse a lot of things from year to year!) I have a printable shopping list for you at the end of this post, so be sure to grab that! - Design your room into three sections--East Egg, West Egg, and The Valley of Ashes. By chance based on where students' seats already are, some students will "live" in the old money "white palaces of fashionable East Egg glitter[ing]along the water" (decorate with white, gold, and glitter). Others will live in new or upcoming money "West Egg, the well, the less fashionable of the two" (decorate with green for money and blue for the hope of growth). And the rest will live in the little to no money Valley of Ashes which is "a certain desolate area of land...a fantastic farm where ashes grow like wheat into ridges and hills and grotesque gardens" (decorate with gray and black to indicate "where dreams go to die"). *Provide opportunities for games- Not only do your lucky students get to sit in the most glamorous area of your room, but they also get double the play money than West Eggers and triple the amount than those in the Valley of Ashes (who don't get any). Explain to your students that this is their lot in life, but since it's the 1920s anything is possible, anything at all! Therefore, as you read the novel, give all students chances to win fake money through review games and Socratic seminar insights. 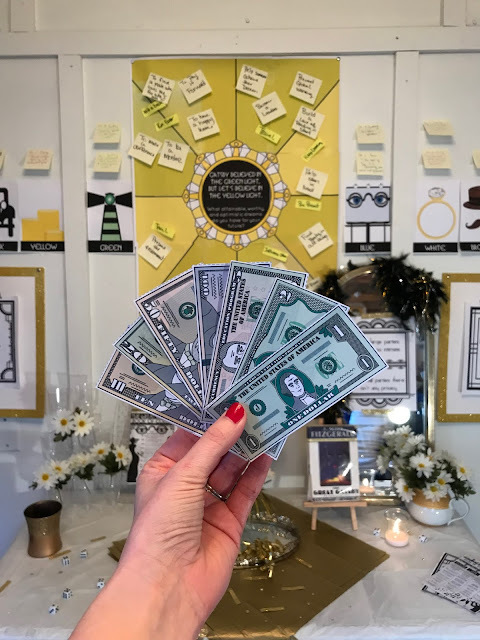 This play money can be used as a way to keep up with winning teams and incentives for review games, but if you really want to make an impactful cross-curricular lesson, let students play the stock market game with their fake money. By implementing the stock market game, students will find that circumstance (their lot in life) and luck played a role in who made it big and kept it big in the 1920s. It's best to work with your economics teacher for this idea, but here is a resource that explains the 1920's stock market game pretty well. By the end of the novel, allow students to reflect on how many people ended up in East Egg (those with the most money) and how this simulation relates to the themes in The Great Gatsby. This 1920's avatar creator teaches students about color symbolism and provides an awesome way for students to "get into character" before beginning The Great Gatsby! 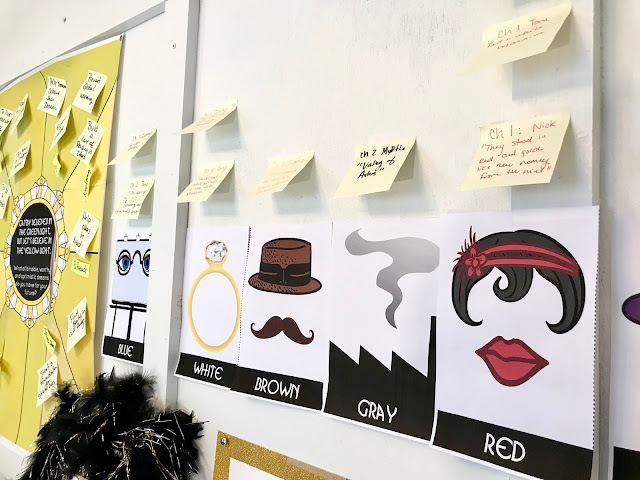 Not only do I have my students keep up with the colors individually with their Great Gatsby Color Analysis Book, but I also want to them create large-scale forms of tracking within groups. A great way to do this is to have groups or whole classes create literary bar graphs. I've done this with so many things from tracking rhetorical devices in Animal Farm to Ethos, Pathos, and Logos in the Julius Ceasar speeches. All need to create a literary bar graph of any kind is some form of uniform sizing (I use sticky notes), lables for what is being tracked, and evidence from students (which go on the sticky notes). *Have one group or class track the more prominent or important color within each chapter (this will generate lots of critical thinking about which color is the most important each time) to see if those colors reveal more about the plot. 5. 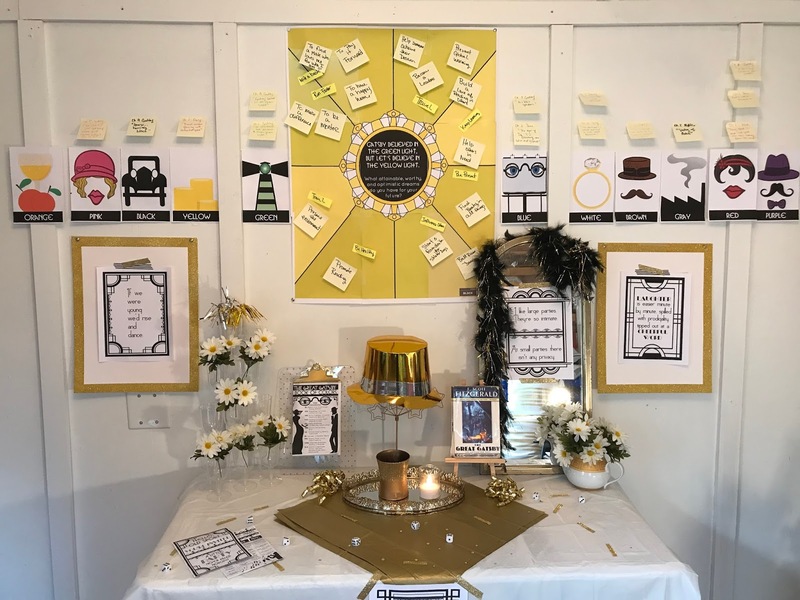 You can still wow students on their party day- Just because students have seen your decorations for 3+weeks doesn't mean that they can't still be wowed on their Gatsby Party day! By this time, you've probably already spent your budget on decorations, so let the students do all of the work! Back in the day when learning styles were all the rage (isn't it funny how education trends work? ), I had the most successful Gatsby party ever by assigning students jobs based on their learning style! This worked well because students had a choice, and it prevented the awkwardness of students who can't afford to bring in food or drinks. 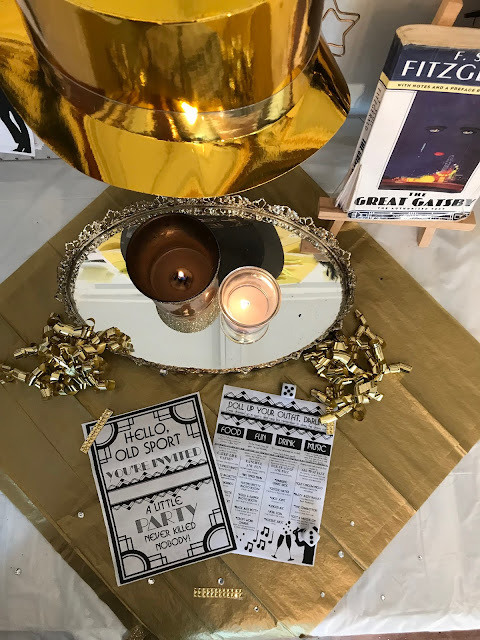 For example, I had musical-minded students create a playlist for the party, kinesthetic-minded students taught 1920's dances, artistic-minded students created backdrops, etc. Though learning styles aren't in vogue at the moment, I still believe in their effectiveness with certain projects! Therefore, I still like to offer lots of different job choices for our party. This gives students ownership and completely transforms a room on party day! I hope that I have convinced you to decorate your room before you begin your Great Gatsby Unit. 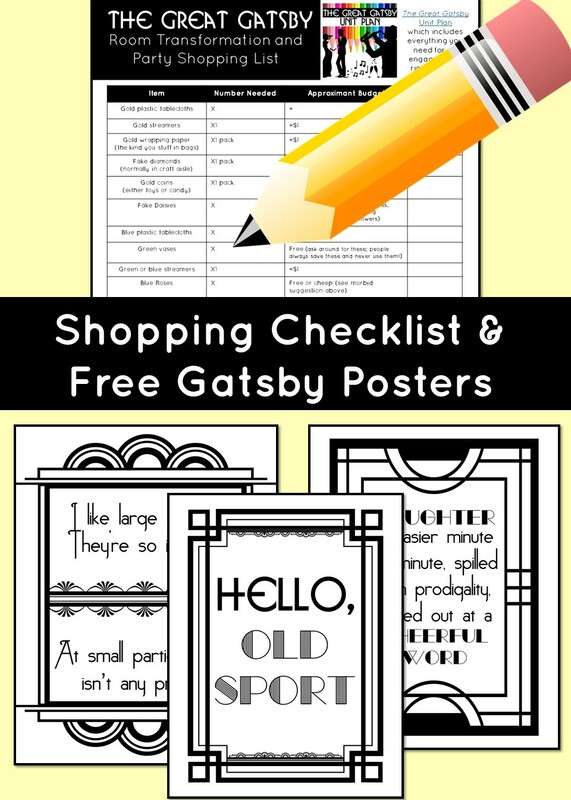 :) To give you the push you need, I have created a shopping list that will keep your budget under $30 while creating an environment for engagement for The Great Gatsby. 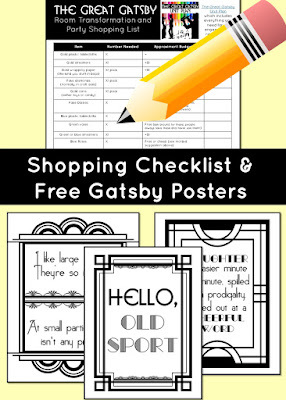 I have also included four Gatsby quote posters for you! To get these, simply sign up for my email list here, confirm your subscription, and look for the PDF file to arrive! Sign up to receive this checklist and posters!